Hotels in Bansko, Bulgaria available for booking. Make reservations now! Bansko is situated in Southwestern Bulgaria, Blagoevgrad. Situated at the foot of Pirin Mountain. Bansko is one of the largest ski resorts in Bulgaria, offers visitors excellent conditions for skiing in modern ski facilities and new cabin lift in combination with Christian architecture and delicious Bulgarian dishes. Bansko remains an attractive destination during other seasons of the year, offering different routes to enjoy the beautiful scenery. Complex Maria Antoaneta Residence is located on the river bank in Bansko, just 3 minutes walk from the local ski lifts and Bansko Mall. It has a large terraced garden with a seasonal outdoor swimming pool. We are situated in the heart of the town, 10 minutes away from the centre, on a quiet street with traditional architecture. We are also 15 minutes away from the lift station, to which we offer transport for the skiers. St. George & Spa Hotel is a luxurious and modern 4-star hotel in the ski area of Bansko. The large indoor pool overlooks the garden, through floor-to-ceiling windows. The Tanne resort complex is a 4-star Bulgarian hotel de luxe, that works throughout the whole year. 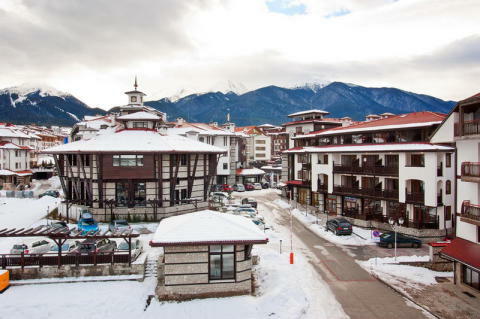 It is situated in the foothills of Pirin Mountain in one of the most beautiful Bulgarian towns, Bansko. Dumanov Hotel is a new three star hotel class. Built in traditional style but in line with modern requirements and standards.